French Provincial Kitchens | French Provincial Kitchen Handles | FlatPackKitchens . 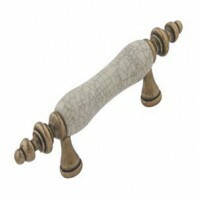 This porcelain and brass handle has a breme crackle & antique Brass details. 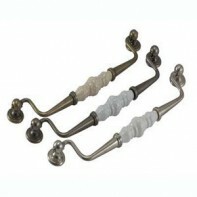 Material: porcelain & Zinc alloy Out side diameter is 126mm .. The porcelain has a crackle effect fro detail. This handle looks great in high end kitchens. 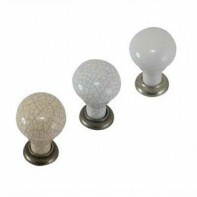 Material: Procelian & Zinc Alloy Colour: Creme crackle & Antique brass, Outside width 127mm ..
Great looking porclian knobs come in 3 colours, This will be a prefect match to a provicial or country kitchen. 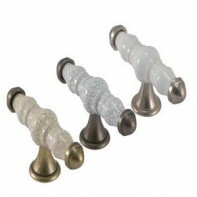 Material: Porcelain & Zinc alloy Colours: Creme crackle & Antique brass, White crackle & Pewter, White & Brushed Nickel ..